Happy birthday Arti. I have made some orange carrot muffins today. Catch a plane and come down. Hope you get a more delicious and decorated cake than the muffins. 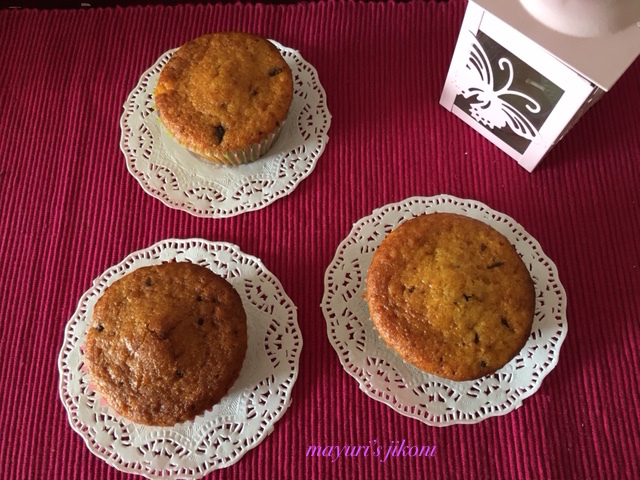 Orange and carrots are a nice combination for cakes, muffins and juice. The muffins turned out soft and yummy. I forgot I was making muffins with eggs. As I normally do, I filled the cups three quarter of the way and some of the muffins had a huge dome on top. Have to remember next time to fill the cups only halfway. The original recipe is from Martha Stewart but as usual I added my own things to it. Orange, walnuts are missing from her recipe and she used pumpkin spice which I didn’t have any. You can add any nuts or dried fruit to it. I love the way one can play around with ingredients to create new muffins. Preheat the oven to 180°C. Line a muffin tray or cups with paper cups. Sieve flour, baking powder, baking soda and salt together. Add the chopped walnuts to the flour and mix. In another bowl add egg, sugar, butter, orange zest and yogurt. Whisk everything together till is it a bit frothy. Add the liquid to the dry ingredients. Mix just enough so that the flour is wet. Add the shredded carrots. Mix gently. Spoon the mixture into the lined muffin tray or cups. Remember to fill it only half way. Bake in the hot oven for 25 to 30 minutes or till the tops are light golden brown. Insert a toothpick into the middle of one muffin. If it comes out clean, the muffins are done. Remove the muffins from the oven. Remove them from the tray or muffins cups. Let them cool on a wire rack. If the muffins are not done in 25 to 30 minutes and you feel the tops may begin to burn, lower the temperature to 150°C. Pumpkin spice is 1½ tsp cinnamon powder, ¼ tsp ginger powder and ¼ tsp nutmeg powder. Add pumpkin powder instead of orange zest. Add raisins or any other nuts instead of walnuts. Remember to peel the carrots before shredding them.